Tired of the saccharine crap that floods radio waves from early November to early January? It’s the same old derivative playlists only lightly spiced up by flavor of the year bubblegum pop. After a while, it’s grating to the mind and soul. Now, for gloomy souls like myself, there’s a genre of music that appeals as a proper alternative. I speak of dark ambient/atmospheric music. Combining this with the motifs and inspirations of the early winter holidays and you have the recipe for a fantastically freaky but festive experience. Groups such as Nox Arcana have created their own contributions to yuletide terror, with their own excellent releases. This time around, it’s Midnight Syndicate’s turn to show their musical mastery for a truly magical christmas time. When I speak of “christmas magic”, I’m not talking about holly jolly merriment, I’m speaking of the twisted and bizarre folklore that extends several centuries at the very least; strange shadowy beings, seemingly alive winter winds, strange monstrosities, wandering ghostly spirits and tons more. These are the myths crafted in small villages and written by just as crafty poets. Whether it be St. Nick’s demonic helper from the Alps or the ghosts that haunt Scrooge in A Christmas Carol, the weird and supernatural is just as much a part of Christmas as it is Halloween. With that, there’s plenty of reason behind a horror-oriented Christmas album. I’m referring to the latest release by atmospheric gothic music group, Midnight Syndicate. Their newest release, “Christmas A Ghostly Gathering” has a mix of original pieces and dark takes on traditional hymns and holiday essentials. In a sense, it’s like Midnight Syndicate heard the soundtrack to “A Nightmare before Christmas” and wanted to make their own take on Horror for the Holidays. Read on for more. As I’ve stated in prior reviews, Sam Haynes’ work has a focus on ambient textures mixed in with some electric groove beats. With plenty of tracks to wake the dead at any party or terrify guests of any corporeal state, his twisted creations bring a delightful variety to the table. Plus, it’s been interesting to see how he’s altered and evolved his sound with incorporation of new motifs and styles. So, how does this album change the mold? 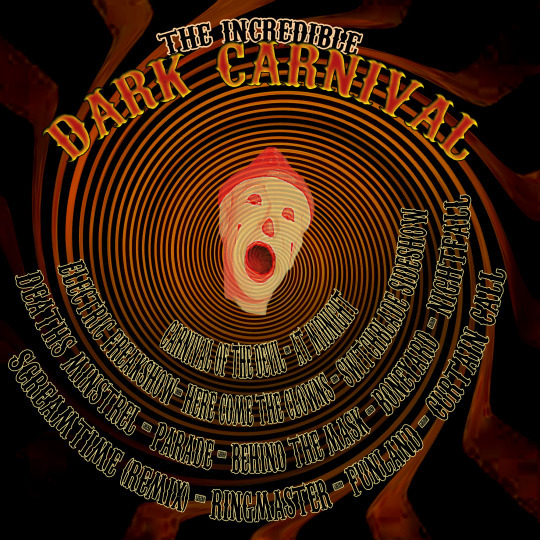 Buy your ticket for the show and attend The Incredible Dark Carnival to find out. As I finish writing the review for a new book, here’s a look back at an awesome album from independent artist, “Jim Strange”. His blend of post-punk, americana, and heavy music is one hell of a ride! Here’s Jime Strange with The Proud and the Damned, with their latest album “Pox Americana”. – From the band’s Bio. Howdy, tumblrland! Doc. Necrotic, here; returning to my endless search for music, both known and not so known. This time, I venture into the work of “Jim Strange” and his band “The Proud and the Damned.” His latest album, “Pox America” is a hard and heavy ride through roadside America; and we took a wrong turn straight on leading into the pits of Hell themselves. And ya know what? The result is… groovy.